VVCD - 97019 Sergei Taneyev. Trio for piano, violin and cello in D major. Quartet for piano, violin, viola and cello in E major. Prize-winners of the First Taneyev Chamber Music Competition. Sergei Taneev (1856 - 1915) was Tchaikovsky's favourite pupil and in his turn a teacher of Rachmaninov and Scryabin among many others. Fundamental for his style of music were chamber genres. 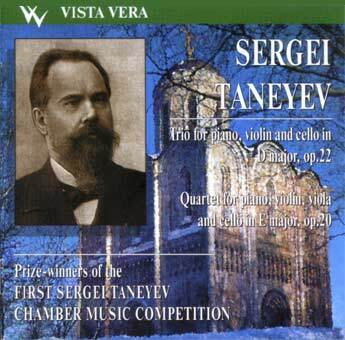 As a tribute to the memory of Sergei Taneev the First All-Russian chamber music competition was organized in the ancient Russian city of Kaluga. The winners of the competition Taneev-trio, Anima-quartet, Roslavets-trio, Art-trio - are all represented on this disc playing Taneev's Trio for piano, violin and cello and Quartet for piano, violin, viola and cello.. The recordings made by Vista Vera at the Maly Hall of the Moscow Conservatoire in 1996.